Forget dieting, just control your portions, argues a nutrition guru. Nutritionist Lisa Young presents a plan for weight loss and weight stability that will appeal to those who enjoy eating: You can still eat all the foods you like, just less of some of them. 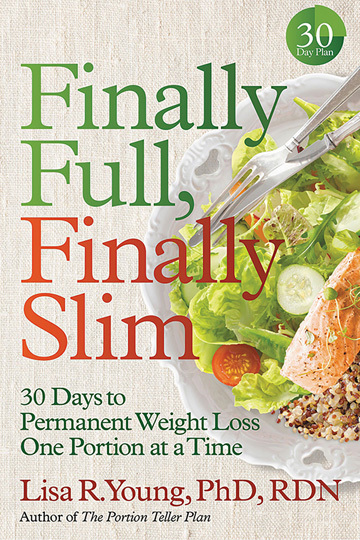 Her new book, “Finally Full, Finally Slim: 30 Days to Permanent Weight Loss One Portion at a Time” (Center Street), is straightforward and sensible, and her tone is encouraging. She includes advice that will help readers lose weight and also promote better health and wellness. And you don’t have to go hungry. “This is a lifestyle plan instead of a rigid diet book. Diets don’t work,” she tells The Jewish Week in an interview. Her emphasis on portion control grows out of research she did while pursuing her doctoral degree at New York University, with the mentorship of distinguished nutritionist Marion Nestle. In the 1980s, Young noticed that food portions had gotten much larger, with supersizing of restaurant meals; giant sodas, muffins, bagels and steaks; and mounds of pasta the new normal. A national survey at the time reported that the average American gained eight pounds in the 1980s (compared to one or two pounds in the 60s and 70s). For her doctoral thesis, she traced the history of portion sizes and the effect of larger portions on weight gain. Most of her colleagues were then debating the benefits and disadvantages of fats and carbohydrates. In the early 2000s, she published several academic papers connecting growing portion sizes with obesity. She writes that she has since assumed the role of “portion advocate.” Her first book, published in 2005, was “The Portion Teller Plan,” outlining an eating plan. The new book is based on research conducted since then. Young shows how the human hand can be used to measure proper portions, and recommends balanced but limited quantities of grains and starchy vegetables; protein like fish, poultry, meat and meat alternatives; dairy; fats and sweets; with unlimited amounts of fruits and vegetables. “I guarantee you that no one ever got fat from eating too many vegetables,” she says. After attending high school at Ramaz and studying health care administration in college, Young ran a weight-loss program that sparked her interest in nutrition. She then went on to get her master’s and doctoral degrees. Now she teaches as an adjunct professor at New York University, and is also a registered dietician in private practice, a lecturer and a consultant. About Jews and the temptations of overeating on Shabbat, Young suggests awareness and structuring of one’s eating. “The trap is that every week when people go to a kiddush, the food is there, and they feel compelled to eat. You can eat challah, noodle pudding and cholent if you want, but in small servings.” Even better, she says, is to vary one’s intake week to week. At the sumptuous buffets at weddings and other celebrations, she suggests “doing a lap around” to first view all the offerings and then choosing just a few — and enjoying the company. She also discusses “health halos” — foods that we may perceive as healthy but are actually not particularly good for us — products with labels like organic, gluten-free, sugar-free, low-fat. Many people erroneously assume that they can eat as much as they want of these products. Cookies, she points out, are still cookies.